Traditional relational databases are not designed to cope with the varying agility and scaling requirements of modern day applications; nor can they be made to run on cheap, readily available commodity hardware. This has raised the need to not only change the way databases work, but also how they scale and function. Apache CouchDB addresses these needs. A NoSQL or a Not only SQL database is a non-relational, largely distributed database system that can store and analyse very complicated and unstructured data with ease. It addresses the issues that are faced by modern day applications when using traditional databases. NoSQL comprises a few different types of database technologies, each with its own design, function and set of uses.  Document databases: This category of NoSQL databases pairs each key with a complex data structure called a document, which can store and process data in many different arrangements based on the requirements. These arrangements include key-value pairs, key-array pairs or even a complex data structure such as a nested document. Key-value databases: These are the most simple and widely used NoSQL database technologies. Each object or item in the database is stored with a unique attribute name, also called as key, together with its value. Key-value databases combine a few elements from traditional relational databases as well, such as the ability to provide a value with a type to perform more data operations over it, like an integer or a float. Wide-column databases: These are designed to cope with tremendous volumes of data that can span across millions of columns. These databases, notably, Cassandra and Hadoop HBase, are optimised for processing queries over large datasets, where data is grouped and stored in columns rather than rows. Graph databases: These are based on the concept of Graph Theory. They are designed for data that is well represented and interconnected. Graph databases are commonly used to store information obtained from social media connections, real-world applications, etc. Table 1 briefly compares some of the most common and frequently used NoSQL databases. Now that we have understood what a NoSQL database is, let us have a quick look at some of its key features and benefits compared to traditional relational databases.  Easy and quick scaling: NoSQL databases can scale out much faster than traditional RDBMSs because of the monolithic architecture followed by most of the latter variety. Scaling can be achieved by simply adding more nodes to the NoSQL database cluster according to the data storage needs.  Schema-less data storage: NoSQL databases can store and handle all types of data, whether they are structured, non-structured or even semi-structured. This is possible as NoSQL databases have no fixed data model. This flexibility enables organisations to access and store much larger quantities of data, as and when required.  Quick and easy data manipulation: While traditional relational databases use their own specific query languages to perform any data manipulations and operations, NoSQL databases use JSON and other such object-oriented APIs to perform the same tasks. This makes it easier for developers to code and develop their applications and integrate them to NoSQL databases.  No SPoF (Single Point of Failure): The best part about using a NoSQL database is that most of the underlying complex tasks such as high availability with automatic load balancing, clustering, etc, are all performed and managed by the database itself. Most of the current and popular NoSQL databases come with inbuilt fault tolerance and can continue to function even if a couple of nodes go down. Data mining of logs: NoSQL databases can be used to store and analyse large datasets of logs. A good example of one such NoSQL database is Cassandra, which can manage and mine data out of log files that are extremely large in size. Real-time analytics: NoSQL databases are very popular when it comes to mining data that is constantly changing. Organisations can track the real-time performance of their systems, monitor stocks or track unique user hits on a website when a NoSQL database is used. Big Data processing: Perhaps one of the most interesting and key uses of NoSQL databases is in the Big Data industry, where a NoSQL database can be used to store, analyse and provide useful insights on data that is simply too massive for a traditional RDBMS to handle. Unlike traditional RDBMSs, CouchDB stores its databases as a collection of independent documents. Each of these documents contains its own schema and metadata. The metadata contains additional attributes such as the revision number and replication information, which can be used by developers during the replication process to synchronise two or more CouchDB databases. Note: To install using the source files, download the latest source tar ball from CouchDBs official site: http://couchdb.apache.org/#download. Once downloaded, uncompress it and build the packages using the make command. where COUCHDB_SERVER_IP will be the IP address of the computer on which you have installed CouchDB. This means you have successfully created a new database on CouchDB. CouchDB also allows you to list all your databases in one go using some special built-in commands, such as _all_dbs. Now that our database is ready, let us populate it with a document. As we discussed earlier, documents are the primary unit of data in CouchDB and consist of any number of fields and attachments. Documents also include metadata thats maintained by the database system. Document fields are uniquely named and contain values of varying types (text, number, boolean, lists, etc), and there is no set limit to the text size or element count.  id: This is the unique ID that identifies your document.  rev: This is the revision ID. Revisions are important in CouchDB, as it will not allow a user to update a document unless the documents current revision ID is provided. By now you may be thinking that you need to be a command line Ninja to manage CouchDB. But thats not true because there are Web based tools, like Futon, to manage CouchDB. 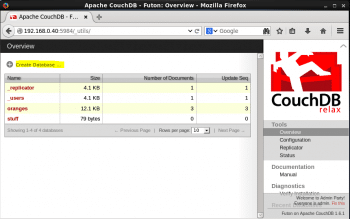 Futon is a Web based user interface provided by CouchDB that helps in the creation, updating and overall management of the databases. You can additionally create and work with documents, list various database configuration parameters and initiate database replication as well, using this UI. You will be presented with a dashboard that contains a Home screen or the Overview tab. This tab shows you a list of databases that you have created on the current CouchDB instance. To the right of the UI, there is a Tools section, where you can select different options that will guide you through changing the databases configuration, enable replication, etc. You can also view the current status and health of your CouchDB instance using the Tools section. To create a new database, select the Create Database button. Provide a suitable name for your database and click Create once you are done. Now that you have created your database, you can populate it with documents, manage the databases security and even delete it, if required. The replication process in CouchDB is an incremental one-way process involving two or more CouchDB database instances. These instances can be on the same CouchDB server or running on a separate node altogether. The main purpose of replication in CouchDB is that, at the end of the process, all active documents from the source database are successfully placed on the remote database as well. Alternatively, if the database is deleted from the sources end, then the same should also get deleted from the remote database as well. In this case, we have two CouchDB instances on two different nodes (DB-HOST-1 and DB-HOST-2). Each CouchDB instance has an empty database created within it. On DB-HOST-1, we have a database called db-01 and on the second host, we have a database called db-02. To test if the replication is a success or not, simply try to create a document in the db-01 database. You should see the document created and listed in the db-02 database as well. Replication can also be triggered using the Futon Web interface. From the Futon dashboard, select the Replicator option from the right-hand side Tools tab as shown in Figure 5. This will display the Replicator wizard, using which you can easily set up and configure a replication process between two CouchDB instances on the same host or on different hosts. To start the replication process, select the Replicate button as shown in Figure 5. You can monitor the status of the replication process from the Status option located under the Tools bar.